The great thing about life is that you are exposed to so many different people, places, and events. One of my best friends attends Penn State University and each year, they host a dance marathon, more commonly referred to as THON. The purpose is to raise money for pediatric cancer research for the Penn State Hershey Medical Center, as well as the Four Diamonds Fund. This fund assists families in offsetting the medical expenses that insurance will not cover. Once again, my friend had the distinct honor in dancing for a cure to “Inspire Tomorrow’s Miracle’s”, which was this year’s THON theme. What makes this so unbelievable is not only the amount of money raised yearly, but the fact that it is raised solely by the students of Penn State. 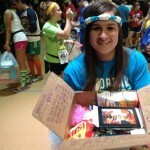 Student’s take a stand and dance the entire weekend for 46 hours straight all for a cure! Unfortunately, I was unable to attend THON this year because of prior commitments, as well as work. But, I was able to stream the entire weekend online and watched the dancers, speakers, bands, and crazy dance competitions from the comfort of my living room. 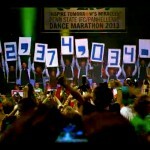 This year, the Penn State Dance Marathon (THON) raised $12,374,034.46… let me repeat that… $12,374,034.46! I am so proud of all the hard work my friend has put into this noble and outstanding cause. I am so proud of you, Emily!! Now, Saint Rose is NOWHERE near the size of Penn State, but did you know there are ways to get involved for a myriad of causes here St. Rose? Yearly, St. Rose hosts a successful Relay for Life event. I was on the committee for a number of years and I can say first hand, it’s a moving 24 hours of hope and remembrance. Get Involved. Relay is coming up on April 26-27th from 6:00pm-6:00am. Be sure to check out their website HERE for more information and to sign up! The Student Association is also hosting their annual “St. Baldrick’s Day” event on April 4th, 2013 in the EAC. This annual event gets students and community members to shave their heads for pediatric cancer research. I’ve done it twice and it’s a THRILLING experience. For more information, check out their Facebook Page! Get involved and give back to those who can’t!! !